Tuesday, me and Kei have a date together!!! XD We'll have lunch together!! I'm so excited!! And we say we'll wear pink colour that day! Haha... Although looks like we do some childish stuff, but you know, when friends can hang out together and wear same colour or same theme apparels, it feels like the bond between are more closer! hehe... So, where we'l have our lunch??? We'll have it at - STEVEN's CORNER!!! If you think it's far from our place, then you're wrong.. You know why??? 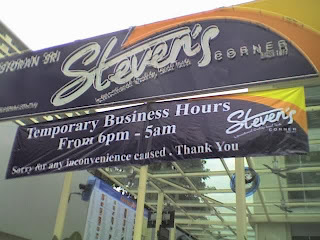 Now, Steven's Corner is not only allocated at Cheras and OUG... It also opens a new branch at SETAPAK!!! SEE!!! Wahahaha... I know these 5 elements combine together you'll think it's something can't imaginable, but surprisingly, it's delicious... for me at least. Haha... And you know what Kei have?? 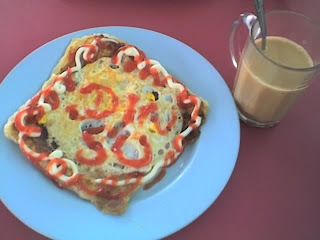 Another special of the restaurant....TADAA!! Wahahahahaha, this sound more interesting isn't??? 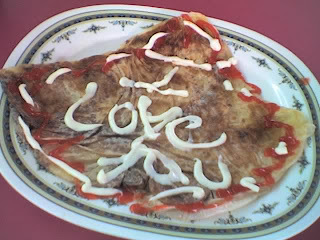 Haha... Everytime I tell my friends there's this kind of food exist you can see their eye brow starts to appear in some kind of weird shape... 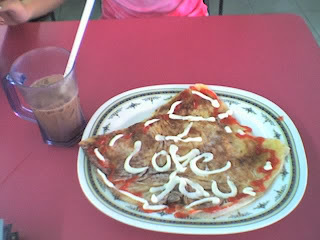 They coudn't imagine or believe there'll be people who dare to order this kind of food! LOL! hahahaha... Ya ya, probably you won't, but surely I'll try at least for once! haha... I'm so full of curiosity!